Amy Steele is leaving her mark in the music industry with her unique refreshing voice. The UK singer is about to dominate the charts with her new single 'Al The Same' featuring American big-hitters Game and Kevin McCall. Amy has been out in the States working hard over the last couple of years, working with some of the biggest names in R&B and Hip-Hop scene. Steele has worked with the Game for her 2011 debut single 'Angel Fall' which received radio play on BBC Radio 1Xtra by DJ Cameo - who premiered the track - and CJ Beatz. Now back with a new single, Amy hits up the Game once again for a guest verse and they are joined by Kevin McCall - singer-songwriter-producer-rapper who famously produced and featured on Chris Brown's Grammy-nominated single 'Deuces'; where both Game and Kevin McCall deliver fresh new bars for this hot track. Not only has Kevin McCall worked with and featured on a lot of Chris Brown's material but he has also worked on tracks with the likes of Diddy, Big Sean, Keri Hilson, Justin Bieber, Rihanna and so much more. 'All The Same' was produced by Starboy Nathan, who made his way back to the music scene late last year as he auditioned for X Factor and was most recently on Big Brother: Celebrity Hijack. Starboy Nathan is of course a Top 40-selling artist, most notably with his 2005 hit 'Come Into My Room'. Maejor Ali (formerly known as Bei Maejor) - credits include: Trey Songz, Justin Bieber and Tinie Tempah. The Monster and The Strangers: Rihanna, Flo Rida, Cher Lloyd 'Swagger Jagger'. The Futuristiks - Eminem, 50 Cent, T.I., Rick Ross, Wiz Khalifa, Jeremih. 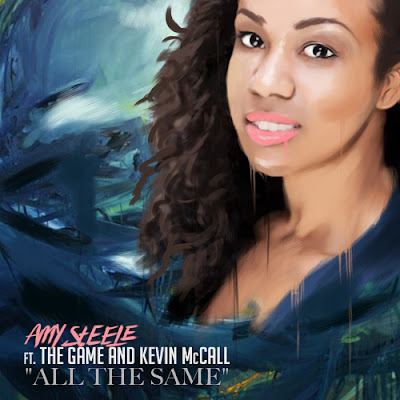 With a all London remix featuring some London's well-known and best artists coming soon for 'All The Same', listen to what Amy Steele's been getting up to in the States and look out for her debut album.